The new 2014 Ford Fiesta ST is a hot hatch with hot sales and is off to a hot start in Europe as hot-hatch buyers are flooding dealer showrooms. What do small car buyers really want? If anyone thinks that performance cars are a thing of the past, we just need to look at what’s going on in Europe. Even with a sluggish economy, Europeans looking for a small car are going after high-performance. The all-new 2014 is a hot hatch in Europe and buyers are snatching up the fastest ever production small car on the planet in big numbers. Ford has reported 3000 orders for the new Fiesta ST all across Europe since reaching dealerships in March. The Fiesta ST is a hot hatch and can produce some exciting speeds quickly. Just what is making the new Fiesta ST so popular with European buyers? Automakers know that they will have to give buyers both performance and efficiency if they want to attract buyers. Ford has designed the new Fiesta ST with even more power than the previous model. It gets 20 percent more power, but it also comes with 20 percent better fuel-economy too. The fastest production small car also gets great fuel efficiency for those who want their performance. It also offers a 20 percent reduction in CO2 emissions to 138 g/km. The new 2014 Ford Fiesta ST is powered by Ford’s 1.6-litre EcoBoost engine, and offers performance-tuned steering, suspension, brakes and enhanced Torque Vectoring Control; as well as Ford MyKey and SYNC with Emergency Assistance. The Europeans are telling us that buyers across the globe still want high-performance cars that are also fuel-efficient. 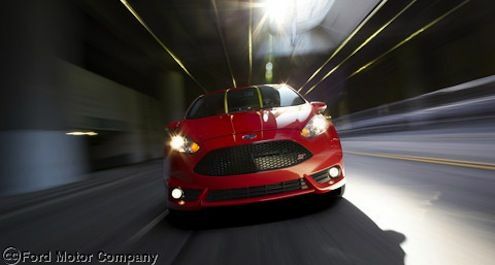 We can look for more automakers to try and copy what Ford has done with the new 2014 Fiesta ST.